Cycling has long been a popular pastime, and many millions of riders across the world use a bike to commute. It’s a great way of getting around our busy cities, but the real fun and enjoyment is to be had off-road. Mountain bikes are among the most popular type of bicycle, as they offer versatility and durability, as well as the opportunity to experience the world we live in up close and personal. Off-road cycling is not only fun, it’s also great exercise. Cycling is good for toing the muscles in the legs, and off-road riding adds some much-needed variety. There’s something very rewarding about getting out and about in the open air, exploring the natural world on two wheels, and it’s not an expensive pastime either. Invest in a well-made, quality mountain bike – from one of many known and proven brands – keep it maintained to a high standard (regular checks are recommended) and you have a cheap method of transport, and a fun way to spend the sunny, summer days. There are plenty of features to consider when buying a mountain bike, so it is handy to have a reliable reference point to refer to for advice. We recommend you take a look at an excellent blog called Bikes on Point; created by a keen cyclist with a passion for finding the very best in new cycling technology, you can read reviews of many of the best bikes on the market – and not just mountain bikes but road bikes and bikes for commuting – plus information on cycling accessories and more, so it’s worth setting some time aside to read such expert advice. A further benefit of riding off-road is that you can make it a fun family day out. It’s much safer for kids than riding on the road, and there are many dedicated off-road trails in a variety of locations. It’s a great way of spending time with the kids, as long as you make sure they have all the correct safety equipment – especially a good quality helmet. There are few better ways of enjoying a fine day than riding a bike, especially when you take it away from the hustle and bustle of the town. You see and feel so much more when you ride in the countryside, and you get to know new places in a way you couldn’t from the confines of a car. It’s a surprisingly relaxing way of spending your free time, too, and don’t forget that it keeps you fit! Investing in a mountain bike is not expensive, and as you will enjoy it more when you ride in fresh places, you will get your money’s worth. Why not check out the great reviews and advice at Bikes on Point right now, and see how it can help you decide which bike to buy? 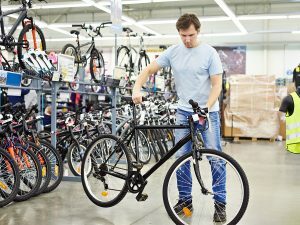 You’ll find there is something for every budget, so take the time to read, and you’ll find a bike that is perfect for you.